Falcon Electrical offer expertly installed and fully interfaced National Fire Alarm Installations throughout the UK. Our engineers maintain their personal knowledge so that you can be assured to receive the most relevant and up to date information. 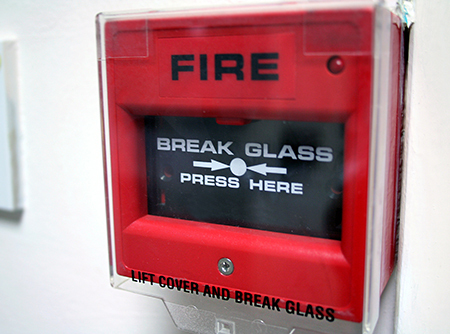 Critically, a professionally installed Fire Alarm system seldom goes wrong, the sounder will be heard throughout the building offering instant awareness of a fire as and when it occurs. Clearly this 'Early Warning' is often a life saver. Primarily the conventional Fire Alarm system has a number of carefully located smoke detection units feeding back to the Fire Alarm panel. Dependent on the size of the building, areas may be zoned. Fire zones are important in so that the general fire location, or system fault, can be identified very quickly. Again this is often a life saver, and in the case of a small developing fire maybe addressed, dependent on a quick risk assessment, knowledge, ability and extinguishers that maybe on hand. Although first and foremost we would always advocate exiting the building as quickly and safely as possible. The only difference between an Addressable and Conventional Fire Alarm system is that with an Addressable Fire Alarm System will detail exactly, on the Fire Panel, which precise unit has activated. The detectors themselves are the same as conventional accept they can be programmed with a unique address. For the vast majority of buildings this system should be classed as essential, it can also be interfaced with a Sprinkler System. Falcon install the best Analogue Addressable Fire Alarm Systems, as these are often considered to be the 'Rolls Royce' of Fire Alarm Systems. Principally each detector is able to monitor itself 'Fire Alarm Unit Intelligence', and reports/communicates back to the Fire Alarm control panel determining a 'real-time' health check for faults, activation's, false alarms or routine maintenance requirements such as cleaning the offending detector head. These advanced Fire Alarm Systems are truly superb and offer a significant reduction in false alarms, making them the ideal choice for large buildings. Wireless Fire Alarm Systems, utilise radio frequencies to activate or report back to the main Fire Panel. Clearly the benefits are obvious in so far as they require no cabling, alleviating the need for redecoration once the installation has been completed. The three differing options detailed on this page are available in a wireless solution.